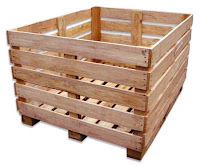 You might have scoured the internet for Eco-friendly storage options only to find that they are scarce and often pricey. Fear not, if you are handy you can reuse some common 'useless' items to make your own storage containers. Of course, these are just a few ideas - use your imagination and your local salvage yard to come up with even more creative options! Large Capacity Recycling: Are your recycling containers so small you have to empty them nearly every day? If you have the space, make a container out of some used burlap bags. You can get some free or at very low cost from your local coffee roaster. Just make a frame out of 2x4s and place the bag in the middle, roll the edges over the frame and secure them with large tacks. Under Bed Storage: I have come across many old dressers that are just too ugly to be placed in a visible space in the house. Often though, they are very well made. Sometimes out of sturdy and high quality hardwood. Find a new use for old dresser drawers by attaching some casters to the bottom and "voila!" - you've got yourself plenty of under bed storage. Great for dorm rooms by the way! Bedding Storage: Use an old wine barrel with lots of character to create a unique storage space for extra pillows, comforters, and bedding. Just make sure it is clean and use an old sheet to make a liner bag. Easy as that! General Organization: Give new life to old wooden crates by creating a fabric liner that will prevent things from falling out. A myriad of things can be stored in these. Organize your craft room, your kids' art supplies, or the glass jar collection (you know, the ones you don't want to recycle just yet because you keep thinking you'll find a use for them). Storage for the Small Things: You know what I am talking about. The small things you find all over your house that do not have a place of their own. The greeting cards from friends, the tape and scissors, pens and pencils... Just use some old shoe boxes and cover them in fabric, there is no end to the possibilities!